February is American Heart Month, helping to educate the public on reducing their risk of developing cardiovascular disease which can lead to a heart attack or stroke. Cardiovascular disease is the leading cause of death in the United States. One of the major risk factors for its development is high blood pressure, also known as hypertension. One in three Americans will develop hypertension in their lifetime. A contributing factor for hypertension is consuming a high-sodium diet. Sodium attracts water drawing it into the bloodstream, increasing the volume of blood which raises your blood pressure, forcing the heart to work harder. Salt is the main source of sodium in the American diet. 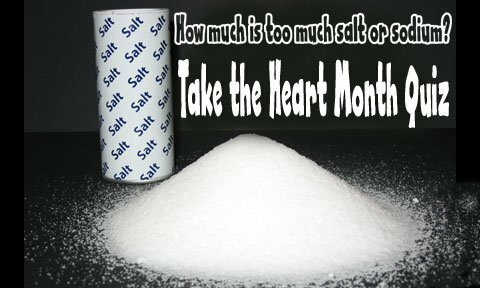 Often, the more salt you eat, the higher your blood pressure will rise. Do salt and sodium mean the same thing? The answer is no. Even though the two words are often used interchangeably, they have different meanings. Salt is a crystal-like compound abundant in nature and helps flavor and preserve food. Salt is composed of one part sodium and one part chloride. Therefore, sodium is one part of the two chemical elements found in salt. Is sodium a necessary mineral for the human body? The answer is YES! Sodium maintains the water balance in our cells, assists nerve transmission and muscle function, controls the body’s acidity and aids in the absorption of glucose. The problem is we tend to get too much of a good thing! What is the average daily consumption of sodium for Americans age 2 years and older? The correct answer is “C,” more than 3400 mg a day. The current Dietary Guidelines for Americans, 2010 recommends no more than 2300 mg of sodium a day for most Americans. However, some people should consume no more than 1500 mg daily. They include people age 51 or older, African Americans, and anyone with high blood pressure, diabetes or chronic kidney problems. Where does the majority of sodium Americans consume – more than 75 percent – come from? The correct answer is “A.” Seventy-seven percent comes from packaged and restaurant food, 12 percent comes from what naturally occurs in food and 11 percent comes from adding salt to food while cooking or at the table. The following foods make up more than 40 percent of our sodium intake: Breads, cold cuts and cured meats, pizza, fresh and processed poultry, soups, sandwiches like cheeseburgers, pasta dishes, cheese and snack foods such as chips, pretzels and popcorn. Why is there so much sodium or salt in our food? Salt adds flavor, acts as a preservative which inhibits food-borne pathogens, binds ingredients, enhances color and gives food a firmer texture. Can a food be high in salt and not taste salty? The answer is yes. Always check the Nutrition Facts Label for the sodium content of food products and choose food with less sodium. Foods containing 35 mg or less per serving are very low in sodium; if the food contains 140 mg or less per serving it is considered low sodium. Which of the following risk factors besides sodium place a person at risk for increasing hypertension, possibly leading to a heart attack or stroke? The correct answer is “G,” all of the above. The older we get, the more likely we’ll develop hypertension. More than half of people aged 55 to 74 have hypertension and three-fourths of people aged 75 or older have it. Know your family health history for hypertension. Carrying excess body weight can increase blood pressure. A weight loss of just 10 pounds can bring about a significant reduction in blood pressure. Become more physically active to help reduce blood pressure. A recommendation by the Surgeon General is for adults to engage in moderate-intensity physical activity for 150 minutes each week. Drinking alcohol excessively is associated with high blood pressure. Moderation is the key – no more than one drink per day for women or two drinks per day for men. Stock up on low sodium foods like fruits and vegetables. High potassium foods such as bananas, potatoes, honeydew melon, beans and yogurt can also help lower blood pressure. The maximum amount of sodium adults should consume per day is 2300 mg.
How many teaspoons equal 2300 mg? The correct answer is “B”, 1 teaspoon. Most adults consume 2 to 3 teaspoons of salt (4,000 to 6,000 mg of sodium) each day. This greatly exceeds the maximum amount recommended, placing them at a higher risk of developing hypertension. Start by checking for the amount of sodium in food. 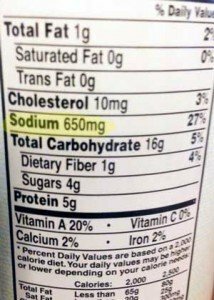 Read the Nutrition Facts Label which lists the Percent Daily Value (%DV) of sodium in one serving of a food. The %DV for sodium is 100 percent of the recommended amount of sodium which is less than 2400 mg per day; 5%DV(120 mg) or less of sodium per serving is low; 20%DV (480 mg) or more of sodium is high. Make food from scratch. This puts you in control of how much salt you put in your food. Use herbs and spices instead of salt for flavoring. Limit the amount of processed foods. Buy fresh or frozen lean meat, poultry and pork instead of luncheon meats, sausage or bacon. Rinse canned foods such as vegetables, beans and tuna to remove much of the sodium content. Look for snack foods like pretzels and chips that are marked “low sodium” or “no-salt-added”. Be careful of condiments such as ketchup, salad dressings, and soy sauce that are very high in sodium. Choose the “no-salt-added” or “lite” or reduced sodium alternatives. So remember, a small “pinch of salt” will go a long way to keeping cardiovascular disease at bay!